“Faith and trust in God is what brings each of us to heaven,” said Sister Marie Chang. Born on January 21, 1924 in Beijing, China, Sister Marie Chang (formerly Filomina Chang) developed her spirituality at an early age. “There were seven children in my family – my father taught us about faith in God and one of my older sisters taught us the catechism and instilled even more faith values,” Sister Marie said. As for her vocation, it was something she has always known. "Ever since I was seven years old I wanted to be a Sister. Even though I was born with a congenital eye defect and physicians thought that I might not complete high school and be blind by the age 30, I prayed that my future would be different,” she said. Sister Marie did not worry for she knew that God would take care of her. “My father continued to take me to physicians for tests and decided to take me to St. Joseph’s Hospital, Jinan. After the tests, I was so happy when Dr. Fan said that I would not go blind,” Sister Marie recalled. Filled with hope, Sister Marie finished Catholic high school and held onto her dream of becoming a Sister. But it was not an easy path. When she decided to meet with the Hospital Sisters in 1943, she traveled from Beijing to Jinan for the meeting (about a ten hour train trip) but was told to return to Beijing to officially inquire. This was during WWII and the American Sisters were interred by the Japanese (along with other American missionaries) in a concentration camp, Christ the King Convent, Beijing. All visitors had to obtain a permission slip and pass by armed guards outside of the camp. She was informed on her visit that the Sisters were waiting for Pope Pius XII to grant permission for a Novitiate in China. On September 17, 1944, after receiving the Papal approval, the Novitiate for the formation of Chinese women opened in Chowtsun, China and three Chinese women entered. 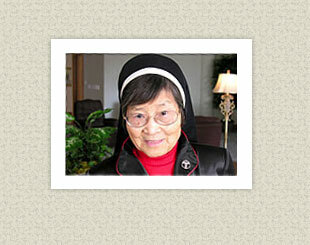 On October 8, 1945, Sister Marie entered with five other Chinese women. Three years later, because of the continued unrest in China from the Communists, the Sisters were called from China to the Motherhouse in Springfield, IL. The Provincial Council of the American Province determined that the young Sisters could safely continue their religious and professional training in America until circumstances improved in China. “It was difficult to leave China but I was thankful that my sister, Sister Mary Louise Chang (also a Hospital Sister) was with our group. The only hope was that we would be in America for only three to five years,” Sister Marie said. However, the conditions did not improve. “After 31 years, we finally were allowed to go home to visit our families. Now, 60 years later, I see how my faith in God helped me through those years,” Sister Marie said. Sister Marie’s assignments have included responsibilities at St. John’s Hospital (Springfield, IL), St. Nicholas Hospital (Sheboygan, WI), and St. Francis Hospital (Litchfield, IL). But one location holds a special place in her heart. From 1966-2005, Sister Marie served at St. Mary’s Hospital (Decatur, IL) with responsibilities in central supply, laundry, and materials management. “I feel like Decatur and St. Mary’s is home. The people were so kind and helpful to me,” she said. In her retirement years, Sister Marie remains an active 83-year-old woman. She crochets, swims, collects angels, and has become proficient on the computer. She also uses her artistic abilities on the computer in creating cards and uses email to communicate with family and friends. Most importantly, her prayer life continues to be part of her day. “Prayer has always been an important part of my relationship with God. It’s so important to know that you do not have to go into a church to pray. God is always ready to listen wherever you are,” she concluded. In 1948, Bishop Cyrillis Jarre, OFM, Bishop of Jinan asked that three Hospital Sisters stay at St. Joseph’s Hospital. The healing mission of the Congregation continued amid difficulties until the last of these Sisters’ death in 1987.